See, what can be more lovely than a pretty young lady calling by with some Christmas cheer? That's a very jaunty hat she's wearing with her matching cloak and I feel it may be time for a hat and cloak renaissance, because it's a good look. If I had a hat and cloak, I too would stride around the neighbourhood with a trug and a terrier, bestowing seasonal jollity upon my fellow man. It's not snowing here yet, unlike last year, so I think I would need to take my wellies and possibly my big waterproof coat, which would spoil the romance of the picture somewhat. I won't bother until the snow comes and I have my velvet lined cloak. And a terrier. Looking at the house she is calling at, the paint on the door is faded and the brickwork isn't as smart as it could be, so we can guess she is bringing charity as well as cheer to either some nice poor people or possibly some elderly relatives. At a very impressionable age I read Little Women and when the sisters give away their Christmas I remember feeling a little conflicted. It seems quite a common theme in Victorian Christmas art (as we will see throughout the month) that the best part of it is what you can do for others. Often these days, Christmas seems to be what you can do for yourself, getting what you want, and the pleasure of helping other people can be missed, which is a damn shame because other people are lovely. Well, most of them. I was a little puzzled by the terrier to start with, as he isn't wearing a collar or a little jacket, possibly to match hers. It occurs to me that the dog may symbolise the woman (no, I haven't been drinking). If the house she is calling at is a poor relation, possibly the dog symbolises her loyalty to them, and her tenaciousness in her dedication. 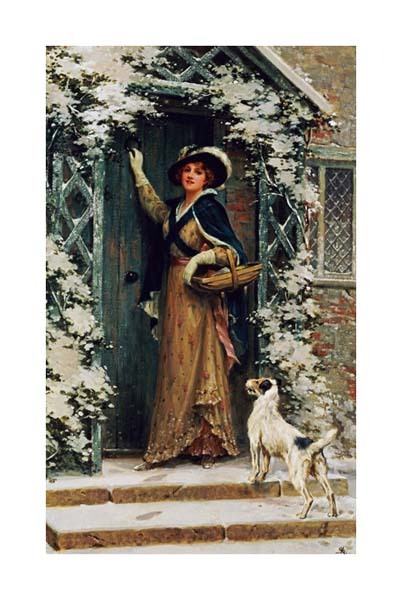 The dog may be there to show that this isn't a 'one-off', that our lady always visits her poor relations when they need her and she always will, despite the fact that she has gone up in the world and now can afford a swanky cloak and hat. Very good Kirsty. Of course they are the deserving poor type and without such help they could easily die in a cold winter. My Mother can still remember the old people dropping from the cold in 1947.